Sai Thy Kingdom Come - The Reappearance of Sri Sathya Sai Baba - "I Shall Resurrect And Come Again"! HomeArticlesAll Articles"I Shall Resurrect And Come Again"! Not many Sai devotees believe in Swami’s reappearance. That being the case, one can imagine how surprised I would have been to hear of a non-Sai-devotee who firmly believes in the return of Sri Sathya Sai Baba! Aarthi Balaji, a facebook friend, shared this amazing story of how Swami inspired someone who was not a Sai devotee to believe in His reappearance. Aarthi’s neighbor's father Mr.V.V. Duraiswamy is a retired math teacher in his seventies. A well-read scholar with a keen interest in Tamil literature, he fervently explores the sublime anthology scribed by Nayanmars and Azhwars (the devotional Saint-Poets of Tamilnadu) in the praise of the various temples in Tamil Nadu. These days Duraiswamy keeps himself engaged by offering voluntary teaching and office-keeping services to the schools affiliated to the Shankara mutt in Chennai, India. Even at his advanced age he still aspires to visit the ancient temples of Tamil Nadu and recite the divine Tamil hymns composed by the Azhwar and Nayanmar saints. Around 27th of April 2011, like many other TV viewers around India, Duraiswamy too watched on TV the last rites being performed to the body of Sri Sathya Sai Baba. Since he was not a follower of Sri Sathya Sai Baba, naturally the event would have been meant to fade into the background of his routine life. However it was not to be! The very next day Swami dramatically appeared in his dream. In the dream, Swami emphatically declared thrice in Duraiswami's native Tamil, “Naan Meendum Uyirthezhundhu Varuven”, meaning “I shall resurrect and come again”! Duraiswamy was quite shaken by this experience as it was unmistakable and very powerful. 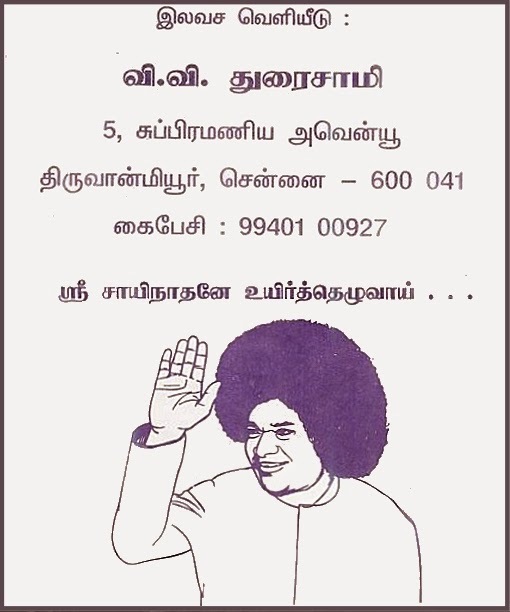 Soon after this, he had an urge to write a small poem in Tamil on the expected resurrection of Bhagawan Sri Sathya Sai Baba. To this day Duraiswamy is unable to fathom how it all came about. The writing is in chaste Tamil and it is a wonder how a non-devotee addresses Swami as Lord Shiva, the one beyond birth and death. In the poem he urges Swami to resurrect. After finishing the poem he decided to print a few copies and distribute them to some Sai devotees he knew. Strangely enough, someone from ‘Thiruvanmayoor’ Sai Center in Chennai, met his wife at a temple and proposed to do a Sai Bhajan at the Duraiswamy residence. They readily accepted. In the meantime, Duraiswamy had been following up desperately with the printers for completing the printing of the poem as it was being delayed inordinately. Finally when the printers delivered the copies, it happened to be on the bhajan day. At the end of the bhajans, Duraiswamy read out the poem to the devotees who attended and also distributed the printed copies to the gathering. When Duraiswamy narrated to Aarthi his experience that lead to the writing of this poem, she became certain of Swami’s divine hands behind the work. In Duraiswamy’s own words “it’s a wonder how the words ran down from my pen as I sat down to write the poem”. Aarthi decided to translate this divinely inspired poem and share it with fellow Sai devotees. As she completed the translation work, Swami blessed Aarthi in a dream that very night. In the dream she found herself in a library that looked antique and ancient. There, in one of the rooms, she saw Swami sitting on a chair reading a book. She initially entered the room and walked out. Then realizing Swami’s presence, re-entered the room thinking “Oh! Swami is here, let me go and take His blessings”. She knelt down in front of Swami, praying for His Padanamaskar. Swami immediately removed His footwear revealing His tender feet. Bowing down, Aarthi placed her head between His lotus feet and the dream ended. She feels blessed that Swami acknowledged her work through this dream. O Gracious Avathar, the righteous One! Can birth and death affect You, the very Shiva? I must say that this Love Poem for the Resurrection of our Beloved Sai.....has moved me to a Joy beyond this world. What a great story and true story!!!!!!! I recommend everyone to re-read this article. Sairam, Heart rending poem from an unknown devotee of God. It is Swami who made him to write those beautiful lines impromptu! Thank you for sharing such beautiful lines which rekindle our faith in Bagawan's reappearance! Om Sri Sai Ram. HERMOSISIMO !!! OM SAI RAM !! !